All his life, Jackson Jones has been cool. He plays football, hangs out with the cool kids, and laughs at misfits and outcasts, otherwise known as nerds. Suddenly, Jackson gets braces, and he loses his friends, his coveted spot on the football team, and his father's respect. Without friends, Jackson has enough extra time on his hands to notice that something very strange is going on with some of his fifth grade classmates. One day, he follows them and discovers a secret portal through the lockers into a world of high-tech spy gear, life-or-death missions, and endless training. And the NERDS team? Well, they hate him, of course. This is the first book in a series of five titles. This book is fast-paced, with plenty of clever quips and insults that will entertain upper elementary readers. At 300 pages, it might overwhelm some readers. While Jackson's success as a spy depends on his ability to develop self-awareness, the book's focus is more about action than characterization. One of the funniest elements of the book is that it reads in the format of a case file, and the reader is periodically asked to submit DNA samples (or cash) in order to continue reading. 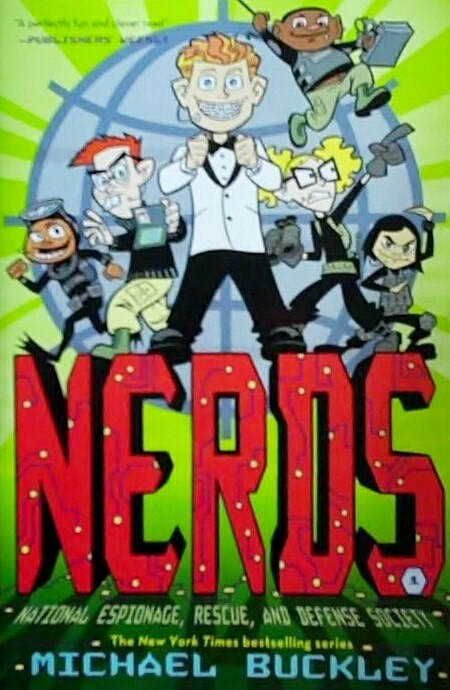 Each member of the NERDS team is equipped with a special power, and most readers will find their ability to take down villains entertaining. Part of the story is told through the viewpoint of the Hyena, a 12-year-old former beauty pageant and would-be assassin who is working for the super-villain, and her story would actually make a powerful book in its own right, without Jackson's point of view.